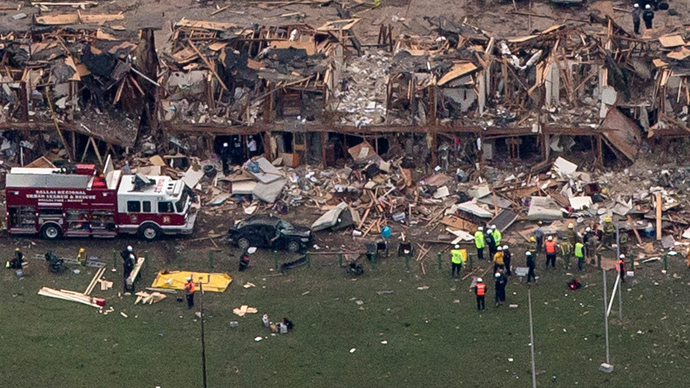 The fertilizer plant which exploded, killing at least 14 and partially razing a small Texas town, failed to alert the DHS it was storing 1,350 times the amount of ammonium nitrate allowable without mandatory safety checks, Reuters reports. West Fertilizer, the owner of the plant, shirked its obligation to tell the Department of Homeland Security (DHS) it was holding such massive quantities of the chemical compound which is widely used in explosives, a source familiar with the agency told Reuters. 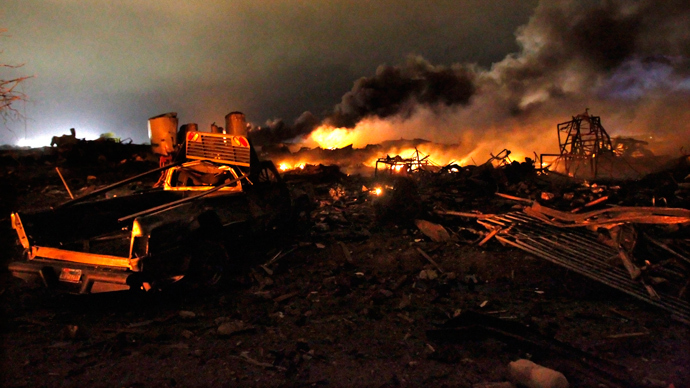 Fertilizer plants and depots must report to the DHS when they hold 400 pounds or more of ammonium nitrate due to its widespread use in the manufacture of bombs. 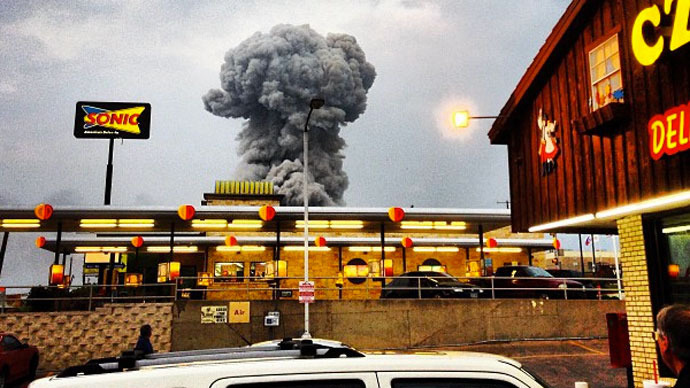 However, at the time of the blast, at least 540,000 pounds (270 tons) of ammonium nitrate was in a storage building, according to recent filings with both the Texas Department of State Health Services and the Environmental Protection Agency (EPA) which were not passed on to the DHS. 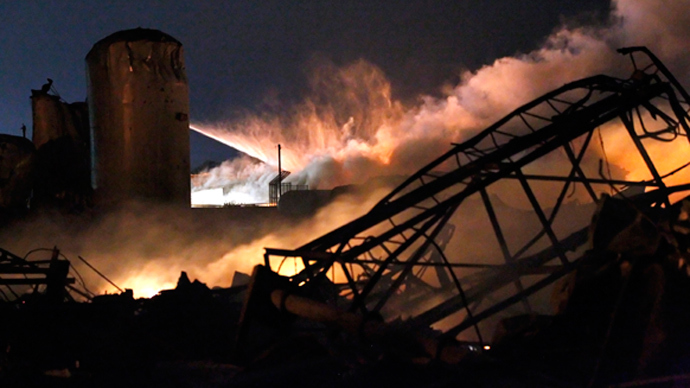 The plant was also holding anhydrous ammonia and several other agriculture chemicals. Pentagon explosives experts say that a blast entailing 270 tons of ammonium nitrate would dwarf virtually any non-nuclear weapons in the US arsenal. It was also more than 100 times the weight of the ammonium nitrate and fuel-oil mix used in the deadly 1995 Oklahoma City bombing, which killed 168 and injured over 800. The company, however, had previously told Texas regulators that any accident at the facility would not be large enough to cause an explosion. A risk management plan filed by the company in 2011 had further failed to mention the presence of ammonium nitrate at the site, the LA Times reports. While the EPA and the Occupational Safety and Health Administration (OSHA) are responsible for overseeing safety at such fertilizer plants, they do not regulate the handling or storage of ammonium nitrate. That responsibility falls mostly under the DHS, which is tasked with aiding in the measurement of plant risks and devising relevant safety plans once the relevant information is passed on by the company. Under this scheme of self-reporting, fertilizer operations can be fined or shut down for failing to inform the DHS of significant volumes of hazardous chemicals. More than 4,000 sites are currently subject to the DHS program. “small number” of field auditors have hindered the department’s monitoring regime, the source told Reuters. Failing to receive a so-called top-screen report from West Fertilizer, the plant flew under the DHS radar, bypassing the Chemical Facility Anti-Terrorism Standards Act (CFATS). The DHS focuses"specifically on enhancing security to reduce the risk of terrorism at certain high-risk chemical facilities," Reuters cites departmental spokesman Peter Boogaard as saying. “willfully off the grid” in the run-up to the explosion. "This facility was known to have chemicals well above the threshold amount to be regulated under the Chemical Facility Anti-Terrorism Standards Act (CFATS), yet we understand that DHS did not even know the plant existed until it blew up," he said in a statement. Investigative reporter David Lindorff told RT that such accidents were the result of "the entire regulatory apparatus” falling into the hands of corporations who benefit from lax regulations.